An architectural jewel in the center of Athens, beautifully designed and decorated with vintage style furniture and small unique artefacts. The Athens Quinta Hostel is a wonderful recently restored neoclassical manor in one of the most interesting and hip neighborhoods in the center of Athens Greece. The location is superb for travelers who want to wander through the city, visit amazing sights or relax and have fun in this lively city. 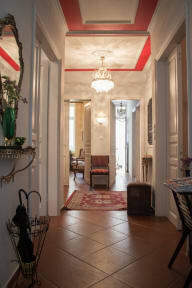 The Athens Quinta Hostel is located in the center of Athens, in the city's artistic, intellectual and cultural area. Located just a few minutes from the hostel are the Metro, countless bars, cafes, restaurants and cinemas. There are bunk beds with lockers and double bedrooms with wardrobes, all of which overlook either the front promenade or the lovely outdoor yard.The hostel offers communal areas, such as a kitchen, a chill-out room, a laundry area and a yard, while the entire building is air-conditioned and provides free WiFi connection. Additional services include movie nights, free coffee, tea, snacks and traditional Greek spoon sweets. Guests are offered advice, suggestions and information about going out. short excursions and sightseeing, as well as city maps to assist them in their touring. Check in from 09:00 to 21:00. Official check-in times are from 9:00 am to 9:00 pm. If you arrive at any other time, you must contact us, especially if it is after midnight so we can make special arrangements. The best host that I stay until now! The staff is very lovey and all people there was amazing. The bedrooms are very clean and every day they had attention with the beds and the cleaning about all. The bathroom was perfect too. All was amazing!!! And the place is very quiet and is lacalizated in a good neighborhood in Athens! Off course when I back to Athens I’ll stay in Athens Quinta!